Musings of a (mostly) Self-Taught Knitter: One more day!!! That's right, the Olympics start tomorrow! Yikes. I've been deep in Olympic Training, and so far it's going pretty well. I can do one sock toe on two circulars. But all bets are off tomorrow when I not only have to progress past one inch of the toe . . . but have to knit another sock at the SAME TIME on the SAME NEEDLES!!!! It's right about now that I've found the perfect Olympic team for me. I'm trying not to panic, but really . . . WHAT WAS I THINKING?? I seem to be addicted to joining Olympic teams, so I also grabbed this button . . .since I am half Italian and Pea is completely Italian. Mangi, baby. With good pasta and wine we can get through anything!!! Are four Olympic teams too many to join?? Naw, I can use all the help I can get. In other knitting news, I finished the first of my legwarmers yesterday. No picture though, and I'm not moving the progress bar to 50% because I'm not quite happy with it. It fits okay, but I think it needs to be a little longer and a little thinner. So it's back to the drawing board. I am really enjoying writing my own pattern for it though!! I mean, I love knitting partially because I can take a ball of yarn and turn it into something. (Thanks Jill for inspiring me to think about that!!) So to be able to write the pattern myself just adds an extra layer to the process. I am creating a project from scratch. It's really cool!!! I'll cast on for my next try tonight. I'm hoping to have time to work on them during the Olympics, but we'll see!! Are all you other Olympian (3300 last time I looked) as panicky about your challenge as I am? Will we make it through? The Olympics are kinda sneaking up like Christmas does, but I'm starting to get psyched. In fact, I'm leaving work at noon tomorrow to be ready to cast on at 2:00! I love the Team What Wa I Thinking button. Yup, I'm ready........you will be too!!!! MMM, pasta. now I want some! Can I join team "What Was I Thinking!"? 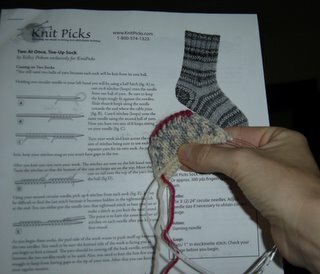 Yikes, I signed up to knit two pairs of socks and my hands seem to rebel when using the smaller needles. I finished the gauge today and even that was grueling. Kudos to you for trying two at the same time on the same needles! I guess it's one way to discourage that second sock syndrome! I WISH I had picked socks!! A whole sweater! WHAT was I thinking??! I love the What Was I Thinking? button!! Me, I'm just an observer?